Style Hailey: This Item is being discontinued to make room for New Styles. 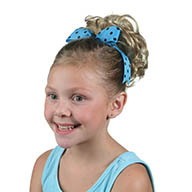 Style Hailey is a bun cover meaning the hairpiece covers your bun fully. The Hailey is 7 inches long pulled has a pocket netting to accomodate girls who also have alot of hair, it has 2 flexible flat combs and a draw string with a locking stopper for a secure attachment. The longer style in this curl would be the style Roller wave 12 inch. Here is a Youtube video of hailey. The 3rd photo on the right is smooth bun style it can be seen at the bottom of this page. Click any thumbnail swatch photo to enlarge. NOTE: The color chart below reflects the colors not always the style. 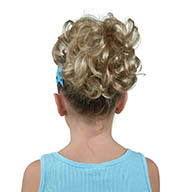 "Buns"-Hot for any sport or event including Dance, Ballet, prom, weddings and of course Cheerleading. These styles fit youth and teen/adult & attach secure and easy just like our other hairpieces with a draw string and 2 flat flexable combs. Our pictures are professionally taken; however, due to everyone's monitor being different we can not guarantee that the color you see is not slightly off. We do accept exchanges, however this is rare. Clink on any thumbnail color swatch photo to enlarge.